My friend Chris Gent hosted a Super Bowl party…big deal huh? 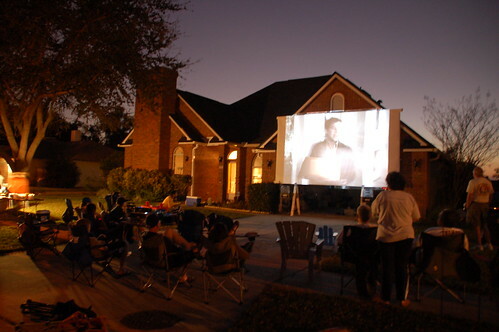 Well when you construct a large screen outside your home and invite the neighbors over it’s a bit different. Thanks for highlighting our annual Super Bowl party! Yesterday marked our fourth year of hosting the party at our home. Prior to that we co-hosted the event at the home of our friends — until they moved out of Orlando. We generally get about 100 of our friends and neighbors to watch the big game on a 20′ screen, full sound system and lots of great food and fun! Great. Now I have projector envy.